This location is incredible with easy drive just less than 2 minutes off the highway, yet affords a really wide ocean view, including the infamous “Whales Tail” and absolutely stunning year-round sunsets. 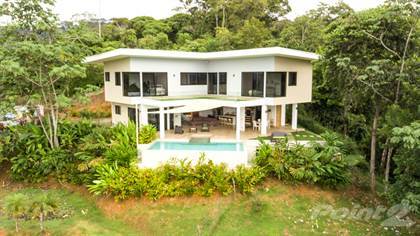 This property is impressive, with its big view and convenient location, less than 5 minutes to Uvita’s town center and/or the beach. Truly this view/location combination cannot be beat! The modern design features over-sized structural beams which allows for the unusually “open and expansive” interior spaces. When you walk into the house, the view grabs you and just does not let go. From every living space and bedroom, you simply cannot take your eyes off the view. Looking through the main living space and out through the high-quality collapsing European glass doors, past the infinity edge pool to the stunning “Whales Tail” view which changes with the tides. Cross ventilation is a noticeable feature of this house which in open areas allows the breeze to consistently pass through, making the interior environment very comfortable. A gorgeous suspended Cristobal wood staircase leads to the second floor which features a large multi-purpose living/office area and two spacious ocean-view master suites, each with extensive closet systems, while one of the suites has a jungle view shower. Each bedroom suite features floor to ceiling windows and patio doors leading to a spacious pool and ocean-view balcony with a combination of porcelain tile and artificial turf for ease of maintenance. All 3 of the bedrooms are equipped with air-conditioners, the beds are Italian memory foam and feature a Murphy-like lift device that allows for storage underneath. Hi, I'd like to find out more information about Modern Home With Stunning Whales Tail View. Thanks so much!